She was a healthy medical student whose parents, brother and sister were all doctors. But – obsessed with her weight – Sarah Houston, 23, was secretly taking a banned and dangerous slimming pill. And just when she told her psychiatrist her bulimia was finally under control, the drug, which is linked to 62 deaths worldwide, claimed her life too. Although banned for human consumption, DNP is easily available online – in capsule form – because it is also a pesticide. At her inquest yesterday, coroner David Hinchliff said it was ‘entirely’ responsible for Miss Houston’s death. Demanding a crackdown on the sale of the capsules, he said manufacturers knew they were bought for weight control. ‘The only motive for manufacturing a toxic substance as a slimming aid would be to profit from people who have the misfortune of having a condition such as Sarah’s,’ he said. 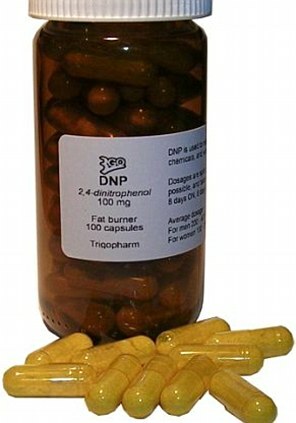 DNP is sold as a weight loss aid, but has been described as ‘extremely dangerous to human health’ by doctors. It is sold mostly over the internet under a number of different names but contains 2, 4-Dinitrophenol. It is marketed mainly to bodybuilders as a weight loss aid as it is thought to dramatically boost metabolism. The manufactured drug is yellow and odourless and was previously used as a herbicide and fungicide. It was launched as a slimming aid in the U.S. in the 1930s but then banned in 1938, due to the severe side-effects. Depending on the amount consumed, signs of acute poisoning could include nausea, vomiting, restlessness, flushed skin, sweating, dizziness, headaches, rapid respiration and irregular heart-beat, possibly leading to coma and death. Miss Houston had taken DNP along with a prescription anti-depressant. The combination of the two drugs, which both boost the metabolism, may have proved fatal, the inquest heard. She was found dead in her bedroom by a flatmate the day after refusing to call an ambulance when she felt hot and unwell. Her family, who are all qualified doctors, pledged to lobby the Government to make DNP illegal. Her father Geoff, 55, said: ‘For those who are selling it, if you have any ounce of decency you must stop. Investigations after her death last September indicated Miss Houston had taken 38 capsules from a packet of 100 of Dinitrophenol (DNP) and the drug was detected in her blood. There was no evidence of an overdose and she was not suicidal, the hearing at Wakefield was told. She had been seeing a psychiatrist for her eating disorder for three years and had improved so much that the sessions were expected to come to an end soon and she was no longer officially bulimic. The evening before she died Miss Houston, a student at the University of Leeds, was breathing heavily, had yellow eyes and had two cold showers to try and cool herself down after complaining of feeling unwell. She was encouraged to call an ambulance by her flatmate, but insisted the symptoms would pass and it wasn’t unusual for her to feel like that. Miss Houston texted a friend the next day but was found later by another flatmate and paramedics called to the address in Leeds pronounced her dead at 5.15pm. Toxicologist Matthew Wade said of DNP: ‘Because it is a banned substance, we don’t really know what would be a safe level to have in the body. ‘The drug affects different people in different ways. Dr Graham Mould, a forensic toxicologist, said taking DNP with the anti-depressant Fluoxetine – also known by the trade name Prozac – may have proved fatal as the effects could have been ‘exacerbated’. He said: ‘We don’t know how long Sarah had been taking DNP but it may have accumulated in her system. It increases the body’s metabolic rate. The side effects can be overheating and breathlessness caused by an increased heart rate and this seems to be consistent with how Sarah was feeling that evening. The medical student had previously been ‘bingeing’ twice daily and ‘purging’ eight times a day, but this was reduced to an average of once a fortnight. ‘She felt like she had the knowledge to combat her eating disorder,’ he added. Miss Houston’s father, mother Gina, 55, sister Vicky, 27, and brother James, 29, are all doctors from Chesham Bois, Bucks. The family said after the hearing they wanted to make people aware of the drug’s dangers ‘so no other family suffer in this way’. They said in a statement: ‘It seems incomprehensible to us that such a toxic substance can be available in tablet form to be sold in the UK for human consumption across the internet. ‘It is perhaps only through her death that the strongest message can come out. Police believe the capsules were imported from Spain. Detective Constable Kate Lonsdale said: ‘The website does flag up that the product is not for human consumption but by selling it in tablet form, they are knowing full well that it is going to be used for weight loss. Recording a verdict of misadventure, Mr Hinchliff said he hoped there would be a ‘campaign’ to get substances such as DNP controlled by law. He said he did not believe Miss Houston intended to harm herself. This is really shocking! I believe the solution for this is that all the bodybuilding supplements should be moderated by FDA. Another aspect is fake supplements, which are also very harmful for human body. Its a major problem in India where teenagers are blindly using bodybuilding supplements without knowing its effects on the body. This kind of articles will be eye opener. This article is also highlighting the effects of bodybuilding supplements.